Broccoli is one of the most useful vegetables, but in Russia it is not very common. Maybe because its price is much higher than ordinary white, or not all know how correctly to cook and eat. This Kale is emerald green in appearance resembles a cauliflower. It also consists of closely placed to each other blossoms. 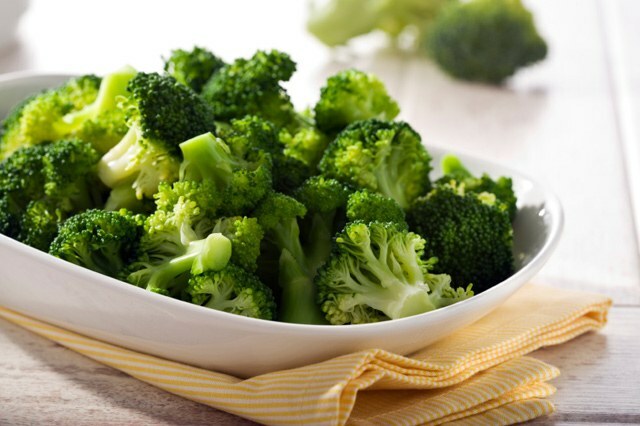 In broccoli contains vitamins A, b, C and E, minerals and, most importantly, vegetable protein and essential amino acids. Of inorganic compounds it is possible to find iron, potassium, calcium, phosphorus, sodium, copper, magnesium, chromium, boron and iodine. In addition, it includes folic acid, choline, methionine, and Riboflavin. The fiber contained in the cabbage, a beneficial effect on intestinal peristalsis, its regular use is a good prevention of atherosclerosis. It also found substances myrosinase and sulforaphane, which have anti-inflammatory and antitumor effect. So eating broccoli – and even prevention of cancer. It is clear that it is very important during thermal treatment, and it is necessary for better absorption of this product, keep all the benefits of this wonderful cabbage. To the maximum amount to maintain the necessary substances for the body, cook the cabbage have long. When cooking broccoli you need to follow the basic principle of cooking vegetables is not to overcook the product. In a double boiler disassembled into inflorescences cabbage-broccoli need to cook for about 8 minutes. Before cooking the cabbage should be well washed, and then to disassemble on inflorescences. To do this, in a small saucepan, boil the sunflower and a little water, then dip the florets in the boiling water. How long to cook them depends on the size of the buds. If they are different size, so that the florets were roasted evenly, large can be cut in half. As a rule, cook broccoli need no more than five minutes. It is worth noting that nutritionists do not recommend long to cook broccoli because the heat treatment takes this cabbage have anti-carcinogenic properties. After boiling, the broccoli should be a little softer, but it does not turn into "mush". From broccoli to make a delicious soup, cook florets in a ready-made vegetable broth, and then chopped them in the blender to puree state. After cooking the cabbage you can immediately put in a bowl of very cold water. This will stop the cooking process of the vegetables and give it a delicious crunchy texture. Cooked broccoli can be used in salads or as a garnish to meat or fish dishes. To enhance its useful properties, in dressings for salads, add a little prepared mustard, a teaspoon of lemon juice, honey and olive oil. Mix up the seasoning ingredients and pour over it a salad or just steamed broccoli florets.